One of the eight original WNBA teams, the Starzz, which was partially named after the old ABA team. Utah Jazz ownership was not interested in keeping the Starzz, and without new owners the team would have folded. The Utah Starzz were a Women’s National Basketball Association (WNBA) team based in Salt Lake City, Utah. They began play in the 1997 WNBA season as one of the league’s eight original teams. The Starzz relocated, in 2003, to San Antonio where the team became the San Antonio Silver Stars. The Starzz were the sister team to the NBA’s Utah Jazz. 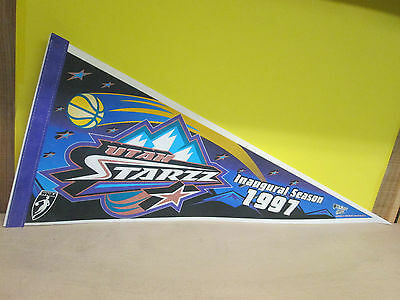 Starzz – The Starzz nickname which was partially named after the old ABA team Utah Stars and the current NBA Utah Jazz. Who is the greatest Utah Starzz? The Utah Starzz were a Women's National Basketball Association (WNBA) team based in Salt Lake City, Utah. They began play in the 1997 WNBA season as one of the league's eight original teams.